Design of the public park at Lady Nelson Place in Red Hill. The ACT Government is redeveloping the Red Hill public housing precinct next to the Red Hill Shops as part of the Asset Recycling Initiative agreement with the Commonwealth Government. As part of this project the ACT Government engaged urban planners RobertsDay to develop an Estate Development Plan (EDP), which will outline the sub-divisions and the block sizes of the development site. In June and July 2016 RobertsDay conducted three workshops for community members to influence the design of the EDP. Following five months of technical testing, the project team presented the final EDP to community members on 9 November 2016. In late 2016 it will be submitted as a Development Application to the Environment, Planning and Sustainable Development Directorate. Part of the EDP is a concept landscape design. Thanks to the many community members who provided input into this design through the workshops, surveys and drop-in sessions in June-July 2016. Below are the landscape designs where the community were invited to share their feedback by 2 December 2016. 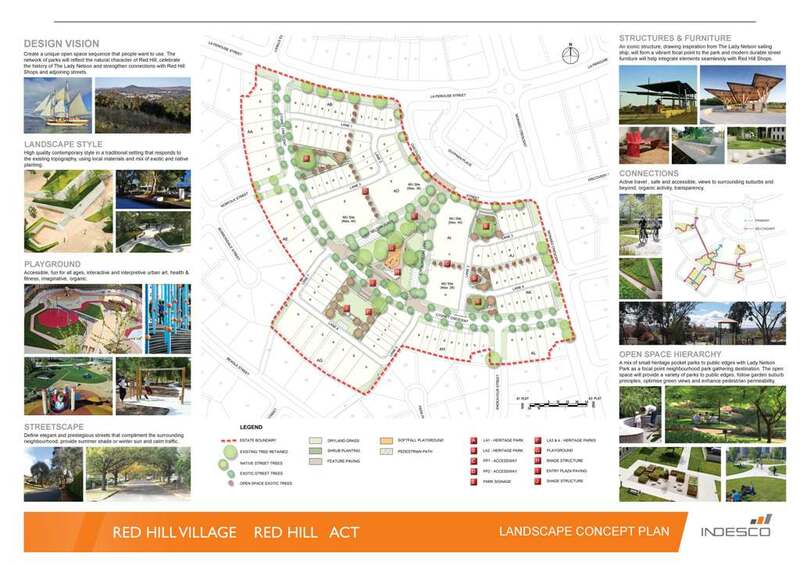 Click here to download a pdf copy of the landscape design for Red Hill redevelopment area. Feedback on this engagement is now closed. The Estate Development Plan will be submitted in late 2016 and will be notified online for public comment here. RobertsDay workshop with community representatives on visions and values of Red Hill held. RobertsDay presented three draft Estate Development Plan concepts developed using from the the first workshop. Community representatives workshoped the concepts presented to identify issues and evolve ideas. Members of the public are invited to attend drop-in consultation sessions to provide feedback and suggestions on draft EDP concepts. Sessions will be held out Manuka Coles. RobertsDay will present a preferred EDP concept to community representatives who will discuss and provide final feedback. Project team presented the final EDP to community members at a public meeting attended by approximately 50 residents..
Community members are invited to provide feedback to the design of the public park on Lady Nelson Place until 2 December 2016. The Estate Development Plan is submitted as a Development Application. Community members can provide feedback through the statutory notification period. This outlines the subdivision layout of the site, including building types and height limits. The dot points on this document outline the changes between this EDP and the previous version distributed at the July 2016 workshop. This document shows the landscape design concept for the central Lady Nelson Park as well as the broader site. This document outlines the community workshop process and outcomes. Please note, there are four files due to file size.